In our couple of blog post related to Back to Basics Series we discussed about Virtual Machine Files (Part1), Standard Switches (Part2), vCenter Server (Part 3),Templates (Part4) vApp Part 5, Migration Part 6,Cloning Part 7,Host Profiles Part 8 and we also discussed about the various tasks related to Home Lab Part1, Part 2, Part 3,Part 4 and Part 5. Dedicated this article to understand the newly introduced concept of VVOL ,So far we have been using the traditional Datastore centric approach/ LUN Centric Approach and now the focus is more towards VM Centric approach. In case of LUN centric approach LUN was responsible for providing both the I/O access and the actual space to store VM files however in VM Centric approach with VVOL's we have seen the two tasks which LUN was capable of doing has been divided into two separate components i.e Protocol Endpoint for (I/O access) and Storage Container for VM files. Virtual Volumes is a new virtual machine disk management and integration framework that exposes virtual disks as primary unit of data management for storage arrays. Virtual Volumes Virtualizes SAN and NAS devices by abstracting physical hardware resources into logical pools of capacity (represented as Virtual Datastore in vSphere) that can be more flexibly consumed and configured to span a portion of, one or several storage arrays. Virtual Volumes defines a new virtual disk container (the Virtual Volume) that is independent of the underlying physical storage representation (LUN, file system, object, etc.). In other terms, with Virtual Volumes the virtual disk becomes the primary unit of data management at the array level. 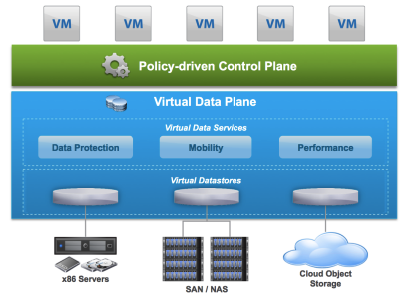 This turns the Virtual Datastore into a VM-centric pool of capacity. It becomes possible to execute storage operations with virtual machine granularity and to provision native array-based data services such as compression, snapshots, de-duplication, encryption, etc. to individual virtual machines. The goal of Virtual Volumes is to provide a simpler operational model for managing virtual machines in external storage while leveraging the rich set of capabilities available in storage arrays. Virtual Volume transforms the data plane and control plane of supported SAN/NAS storage systems by aligning storage consumptions and operations with virtual machines. With Virtual Volumes most of the data operations such as snapshot, cloning, and migrations are offloaded to the storage arrays. VVOL's Requires support of VMware vSphere API for Storage Awareness (VASA 2.0) provided by storage array vendor. VASA use in vSphere provides various features like offloading the VMDK creation and management to the array. vCenter 6.0 and ESXi 6. Once we have the VVOL enabled storage array we need to register the Storage provider in vCenter Server (SMS). Storage Monitoring Service is running in vSphere which helps registering the VASA with vCenter Server. Once the VASA provider is registered with vCenter Server the underlying capabilities of the Storage array are pushed to the vCenter Server thus helping vSphere Admins to create storage policies. On the other hand storage admin will be creating Storage container. Storage admins will also set up Protocol Endpoint (PE) which is providing the I/O access (Virtual Volumes VMDK are bound and unbound to PE by vSphere.